If extra-terrestials visited the moon, they may have left tell-tale signs. It’s worth a look, says a leading scientist, and won’t cost much. Searching for artifacts on the moon left by extra-terrestial visitors might be a long shot but it’s worth a try, according to two scientists at Arizona State University. In a paper published in Acta Astronautica, astrophysicist Paul Davies, and his student, Robert Wagner, suggest that this can be done by closely examining images from an existing spacecraft now in orbit around the moon – the Lunar Reconnaissance Orbiter (LRO) – with the help of volunteers. This LRO image shows Surveyor 6 (that landed on the moon on November 10, 1967) casting an 18 meter-long shadow with the Sun just 8° above the horizon. Image credit: NASA/GSFC/Arizona State University. For over 50 years, SETI (Search for Extra-Terrestial Intelligence), the best known project in the search for technologically advanced alien life, has been monitoring the sky for signals from alien civilizations. But in their November 2011 paper, Davies and Wagner suggest SETI should be complemented by other techniques. In particular, they advocate a close inspection of high resolution lunar surface images for possible alien artifacts, using the avalanche of data from the Lunar Reconnaissance Orbiter (LRO) spacecraft. Davies and Wagner speculate that if aliens left a sign of their past presence on the moon, it would be in one or more of four categories: a message, instruments, trash, and large-scale changes to the lunar landscape. The best available visible-light imagery of the moon comes from the Narrow Angle Camera (NAC) on the Lunar Reconnaissance Orbiter, which has been orbiting the moon since mid-2009. It has imaged over 25 percent of the lunar surface at resolutions down to 50 cm/pixel, in a variety of lighting angles. This dataset is so good that several artifacts have in fact already been found, in both the ‘Instrument’ and ‘Trash’ categories. However, all of them were created by humans. These artifacts include not only the Apollo landing sites, which are easily identified by the thin dark trails of dust kicked up by the astronauts, but also all of the NASA and Soviet unmanned probes, which, with the exception of the two Soviet rovers that left kilometers-long tracks, have nothing to mark their location but their slightly odd-looking shadows, and sometimes a small halo of disturbed dust from the landing rockets. However, in all of these cases, the people who found the artifacts already knew approximately where to look, so they only needed to comb through a few NAC images before they found the lander or rover they were searching for. For alien artifacts, we don’t have the luxury of knowing what latitude and longitude to target, so we need to study the entire surface. Focusing on some regions of special geological interest would help, but there would still be hundreds of images to look through. This is the most attractive possible artifact type to find, as it shows that not only does alien intelligence exist, but that it cares (or cared) about communicating with other intelligent beings, and may even be willing to impart knowledge and wisdom to us. But finding it would be fraught with difficulties. An artifact bearing a message, left just within the past few thousand years, might still be exposed and possibly detectable in LRO images. 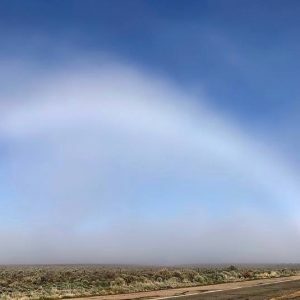 But the longer it’s been there, the more difficult this alien artifact becomes to find, due to obscuration by several million years of lunar dust kicked up by meteorites. Anything left behind in over hundreds of millions of years would have been likely destroyed by meteorite impacts unless it was buried below the lunar surface and made detectable by an emanating signature, possibly long-wave radio or magnetic fields. 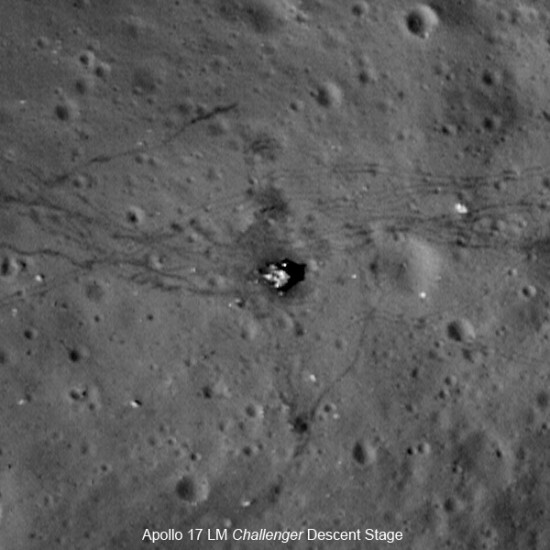 LRO image of the Apollo 17 Lunar Module Challenger descent stage. Image credit: NASA/GSFC/Arizona State University. A scientific instrument left on the moon, perhaps to monitor our planet, would tell us what aliens find interesting about us. It may be difficult to detect it in LRO images, especially if they don’t want it discovered. Davies and Wagner suggest that the best way to find such an object would be to search for signs of a power source. If aliens cruised by and made a stop on the moon, they could have left behind a pile of trash, after all, it wouldn’t make much sense to take it with them since its extra mass would expend more fuel. Small items would be difficult to find in LRO images. But large objects like habitat domes or solar arrays may be visible in LRO images. If nuclear waste were discovered during a future mission, a measurement of the half-life of radioactive isotopes could indicate how long it’s been there. 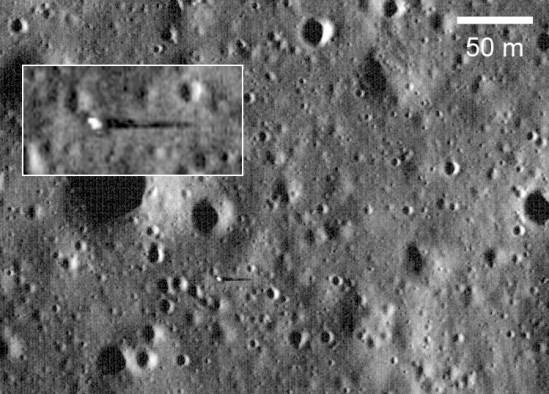 The Marius Hills pit, shown in this LRO image, is thought to be a possible skylight in a lava tube, in an ancient volcanic region. Image credit: NASA/GSFC/Arizona State University. 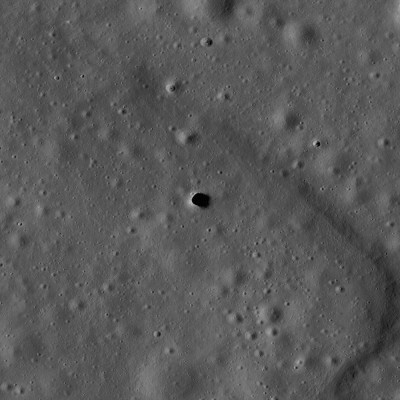 A good place to look for alien trash is inside one of the lava tubes located in the lunar maria. So far, three large skylights have been discovered by the LRO, each about 100 m across, which might lead down into a subsurface network, and several lunar pits point to a subsurface labyrinth. Lava tubes have been proposed as an ideal location to establish a human base, as they would provide protection from radiation and meteorites; perhaps aliens would come to the same conclusion. Furthermore, the same factors that make lava tubes attractive as a habitat imply that any artifacts left behind would endure almost indefinitely, undamaged and unburied. The downside is that there is no way to really investigate this possibility from orbit, so any confirmation or refutation will require a new robotic or human mission to the surface. Large scale changes to the landscape, possibly due to mining or quarrying could be difficult to identify in LRO images due to accumulation of lunar dust due to meteorite impacts. But if geometric outlines remain, it might provide compelling evidence of extra-terrestial activity. It’s a challenging endeavor. Davies and Wagner acknowledge, in their paper, that the odds of finding evidence of alien visits on the moon are extremely low. 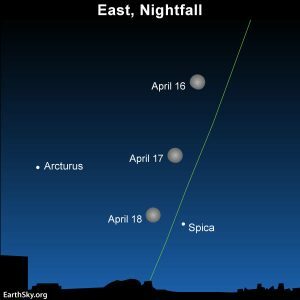 Even if the moon has been visited by a probe or expedition there is no reason to suppose that this would have happened in the recent past, so we may be dealing with time scales measured in tens of millions of years or longer. In spite of the highly preserving environment of the lunar surface, the problems of identifying very ancient remains or traces of alien activity are formidable. But these problems are not insurmountable, and the strategies we have outlined in this paper offer a low-cost approach to what would undoubtedly be one of the greatest scientific discoveries of all time. 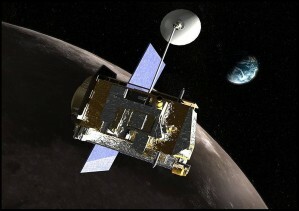 Artist’s rendition of the Lunar Reconnaissance Orbiter (LRO). Image credit: NASA. Bottom line: In a nutshell, astrophysicist Paul Davies, and his student, Robert Wagner, of Arizona State University, believe that combing through images from the Lunar Reconnaissance Orbiter (LRO) might yield evidence of past intelligent alien activity on the moon. They acknowledge that the odds of a discovery are slim, but because the images would be readily available and the work would rely on volunteers, it won’t cost much money and it’s worth a try.